As if losing the hair on your head isn't distressing enough, imagine the impact of losing your eyebrows as a result of chemotherapy. Eyebrows are the features on our face that help punctuate emotion and are central to how we picture ourselves as individuals. 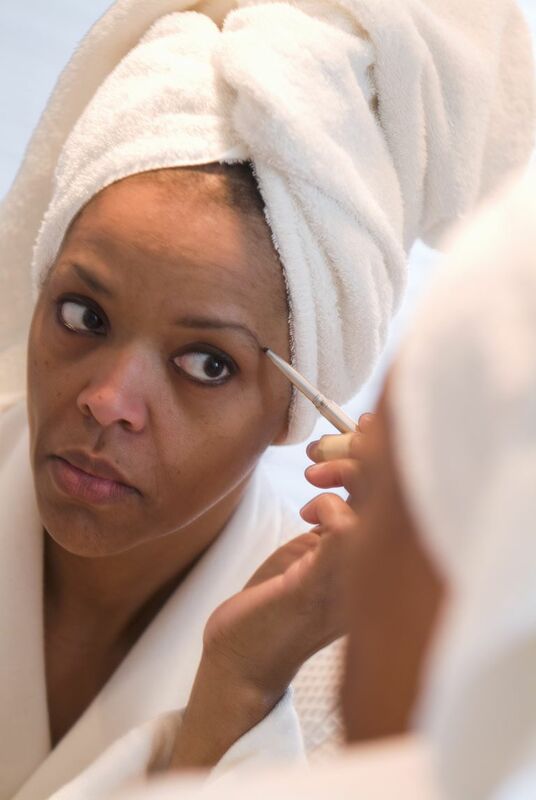 While many people undergoing chemo are able to cope with hair loss on their head, eyebrows are another thing altogether. Without them, people often describe themselves as looking vague, emotionless, or just plain ill.
Thankfully, this symptom is most often temporary in people undergoing chemo. Hair loss due to radiation therapy, by contrast, is more often permanent. Hair loss (alopecia) is commonly seen side effects of chemotherapy, impacting not your head and scalp but your eyebrows, eyelashes, body hair, and even pubic hair. The chance that you will lose your hair depends largely on the type and dose of chemotherapy drugs you are taking. Chemotherapy is considered to be systemic therapy, meaning it affects the entire body and not just the malignancy. The drugs work by targeting those cells which multiply quickly. Cancer cells are one such type; hair cells are another. Hair loss is one of the unfortunate side effects of chemotherapy. In an effort to eradicate a malignancy, the drugs attack both normal and abnormal cells, resulting in massive casualties on both sides. Other targeted cells include bone marrow and those lining of the stomach. Just like with the hair on your head, eyebrow loss can begin gradually after starting chemo. Results differ from person to person. It is not uncommon to hear of people who lose all of the hair on their head while only experiencing a thinning of their eyebrows. When you first begin to lose your eyebrows, your can choose to pencil them in. All you need is an eyebrow pencil or eyeshadow that lightly disguises any thinning you may be experiencing. If you have completely lost you eyebrows, you can either draw them in (if you have the knack for it) or use an eyebrow stencil available from brands like Bobbi Brown. You may want to consult with a cosmetologist to perfect the techniques firsthand. Cosmetic tattooing is another option men and women choose to deal with eyebrow loss. This tends to be more an option for those who experience permanent loss since the regrowth of eyebrow hair is pretty common after chemo. Don't ever rush into the procedure — since it is permanent — but rather give your hair a chance to grow back. And before booking your tattoo appointment, be sure to speak with your oncologist. The risk of infection is higher in people who have undergone chemotherapy due to immune suppressive nature of the drugs. If you do decide to go ahead, be wary. Sanitary conditions are vital and, sadly, most tattoo establishments are poorly monitored and regulated. A less drastic option is the eyebrow extension. This semi-permanent procedure can be used for those who have thinning eyebrows and need to thicken them or add a little length. You can either use your own hair for the extension or choose a color from a sample of swatches. These are glued in and last for around 14 days. As with tattooing, care needs to be taken to ensure the procedure is done hygienically and that you are not allergic to any of the products used in the extension. Everyone responds differently to eyebrow loss during chemotherapy. Some barely react while others feel the loss gravely, believing that it gives them "the look" of a cancer patient. Whatever your feelings, try to accept them and ignore any voices that tell you otherwise. It is common for loved ones or even strangers to minimize the loss of one's hair. ("It's only hair!") What they fail to realize is that eyebrow loss may simply be the proverbial straw the broke the camel's back. In the end, if it's important for you to restore normal-looking eyebrows, then do it. On the other hand, never feel pressured to paint in eyebrows if it doesn't bother you. Other people's reactions are their own; you need only deal with your own. Some psychologists recommend a technique called reframing to deal with cancer-related hair loss. Instead of focusing on the bad aspects, try to think of the good. It's important to remember, for example, that eyebrow loss is a sign that your cancer treatment is working. So rather than just grieving the loss of your brows, picture your hair loss as a means to an end. By temporarily sacrificing your eyebrows for the cause, you are able to defeat cancer once and for all. Support groups are invaluable in providing the care and support you may need when facing the prospect (or aftermath) of cancer treatment. Other groups are have also been set up to address issues of self-esteem and self-confidence in those undergoing therapy. One such group is Look Good, Feel Better, a non-profit organization which aims to help women feel better about their physical appearance during and after chemo. They offer free group makeovers for women with cancer while providing an array of makeup tips and advice on their website. An online locator allows you to plug in your zip code to find the group makeover nearest you. Dua, P.; Heiland, M.; Kracen, A.; et al. "Cancer-related hair loss: a selective review of alopecia research literature." Psycho-Oncology. November 2015; 26(4):438-443. Can You Prevent Hair Loss From Chemotherapy? How Can You Cope With That Awful Taste During Chemo? Can Acupressure Help With Nausea and Vomiting From Chemotherapy? Will I Lose My Pubic Hair If With Chemotherapy? Will You Lose Your Eyelashes During Chemotherapy? Which Breast Cancer Chemotherapy Drugs Cause Hair Loss?